Did you know that eighty years before the Pilgrims landed at Plymouth Rock, there was a Muslim slave exploring what is now Southwest America alongside the conquistadors? Did you know that Thomas Jefferson owned a Qur’an? Did you know that without the help of American Muslims, Ray Charles may never have been famous? These and many other amazing facts are revealed in Amir Hussain’s short book, Muslims and the Making of America. The author admits that this book is a broad introduction to the history of American Muslims, but it is full to bursting with facts. Hussain shows that Muslims worldwide, are not a homogeneous stereotype. The religion crosses races, ages, countries, genders, and pay grade. We also get a history lesson; Hussain details how Muslim individuals, and communities have shaped music, medicine, architecture, and sports throughout our country’s lifetime. With this book, Hussain sets out to demonstrate that Islam is more American than apple pie, and he does so eloquently. Muslims and the Making of America clearly shows that without Muslims, America wouldn’t be what it is today. Check the Pinellas Public Library Catalog for Muslims and the Making of America. Search for this book at your local library via WorldCat. Categories: Beth's Picks, Books, Nonfiction, Religion/Spirituality | Permalink. The contents of this book are a compilation of Albert Einstein’s articles, addresses, assorted papers, and letters published posthumously and edited by the Einstein estate. These accessible essays provide a glimpse into the inner workings of Einstein’s famous mind. Topics covered include: the self, moral decay, morals and emotions, and the goal of human existence. A portrait of trials, tribulations, and understanding, Out of My Later Years conveys the insight of the modern world’s most celebrated intellectual on a range of societal topics, many of which remain relevant today. Before or after you watch National Geographic’s Genius, this collection will help further illustrate that this man knew much, not just about the physics of the universe, but also about the inner workings of the universe’s most minor denizens. Check the PPLC Catalog for Out of My Later Years. Categories: Books, Cheri's Picks, Essays, Nonfiction, Philosophy | Permalink. Humans have evolved to eat a wide variety of food. From roots and grains to fruits and vegetables to meat and nuts, it seems like no other animal on Earth can eat like we can, especially since we learned how to cook. This adaptable eating ability allowed our ancestors to survive whenever regular food supplies ran low. But that was then, and now our omnivore nature turns a simple question like “What should we have for dinner?” into a serious conundrum. Beyond health, taste, and convenience, there are also ethical and environmental effects to consider, as many modern food production practices can be cruel to animals and unsustainable for farmable land. Further, most fruits, vegetables, and meat have become available year-round thanks to advances in production, refrigeration, and transportation—a fact that only complicates the omnivore’s dilemma and takes an additional toll on the environment. Author Michael Pollan dissects all the different ways we eat by putting food into categories based on how it’s made: industrial, organic, or hunter-gatherer. He then goes to great lengths to track the food in these categories from production to plate. In the industrial category, he visits standard agricultural and animal farms, focusing the production of corn and how it infiltrates virtually every processed food on the market in surprising ways. In the organic category, he looks at a few different types of organic farming, from the barely-not-industrial to a family-owned farm that takes “working with the land” to the next level. In the hunter-gatherer category, Pollan recruits an acquaintance to show him how to hunt, kill, skin, and prepare his own dinner. I came away from this book with a much better understanding of today’s very long food chain and the problems that come with it. Thankfully, it was not all doom and gloom. Conquering the omnivore’s dilemma all boils down to striking a balance between convenience and sustainability. Just as it’s unreasonable to ask everyone to hunt and grow their own food, it’s equally unreasonable to ask less than 1% of the U.S. population to produce all our food. Somewhere between these two extremes lies the answer. According to Pollan, if you curb your appetite, eat with the seasons, and commit to finding and paying a little extra for local, sustainably grown food, you’ll never again dread the question, “What’s for dinner?” And that’s food for thought. 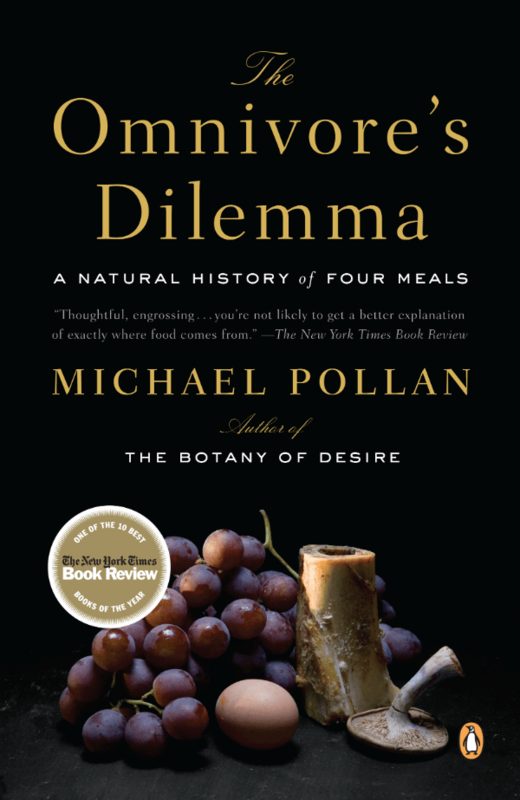 Check the PPLC Catalog for The Omnivore’s Dilemma. Categories: AnnMarie's Picks, Audiobook, Books, Ebook, Food and Drink, Large Print, Nonfiction | Permalink. I have an unpopular opinion to share: I don’t like Stephen King’s writing. I like movies based on his work, but I cannot finish one of his stories without gagging. I love scary stories, so I don’t know what it was that turned me away. But surprise: while I was hesitant to put King’s memoir on my book club’s reading list, but I am very glad I did. Previously, I thought of King as an over-hyped hack. After I was done reading On Writing, I realized I could not have been more wrong. In the first section of the book, King details his early life, growing up, meeting his wife, and starting his writing career. The second section details his writing process. The final section tells the story of his infamous car accident. I had none of my previous issues with On Writing as I did with his fiction. I found my self not only finishing this memoir, but enjoying it. His life story was endearing, and revealed himself to be much more laid back than his popularity would suggest. His description of his writing method showed me that he was every bit a creator as any of my favorite authors. This memoir is part practical advice to new writers and part intimate portrait of Stephen King. I would highly recommend it if you are an aspiring writer, or if you enjoy King’s work. If, like me, you do not enjoy King’s work, I STRONGLY URGE you to read it. On Writing gave me a new perspective on Stephen King and any other writer that I previously “poo-pooed”. I still can’t finish King’s novels, but I now have more respect for him as a writer, and an artist. Check the PPLC Catalog for On Writing. Categories: Beth's Picks, Memoir, Nonfiction | Permalink. So I’m an NPR junkie. A few weeks ago I was listening to Code Switch and heard them discussing the new documentary OJ: Made in America. They made it sound so compelling that I immediately checked it out from the library, and I was not disappointed. Ezra Edelman, the director, manages to create a culturally relevant and interesting new perspective on this well-known, high profile case. I was only five when O.J. Simpson was being tried for the murders of Nicole Brown-Simpson and Ron Goldman and therefore missed all the politics and controversy that surrounded the case. While all the case details were new to me, I was struck by how little U.S. race relations have changed in the past twenty years. With all the recent coverage of the violence that is occurring in streets across America, this documentary could not be more timely. The documentary itself is almost eight hours long but I found it difficult to look away or really do anything productive until it was over. Made in America has in-person interviews with some of O.J.’s old friends, police officers involved with the case, members of the jury, and some of the attorneys who argued the case. It was shocking to hear some of their testimony and the how this case forever changed their lives. Edelman does a stellar job biographing Simpson’s rise to fame and his fall from grace. Whether you believe he was innocent or guilty this documentary offers some serious insight. I recommend this title to those interested in true crime, popular culture, race relations, and history. Almost everyone knows the story but you should definitely watch for the details and cultural relevance. Check the PPLC Catalog for O.J. : Made in America. Categories: Amelia's Picks, Biography, Documentary, Nonfiction, Sports | Permalink. This lovely Vietnamese-French fusion cookbook is also a family history of sorts, with 100 recipes that range from medium difficulty to hard. Rest assured that these meals are worth making, however; Helene An is an award-winning chef who lives in California and caters the most exclusive Hollywood events. Her main restaurant, Crustacean, is a high-end dining destination in Beverly Hills. Jacqueline An sets out to chronicle her family’s history and her mother’s recipes, the two of which are so entwined that they’re almost the same thing. You’ll read about Helene and her husband’s harrowing escape from Saigon and their tentative first steps into the American restaurant business. It’s amazing to think that this world-renowned Vietnamese-fusion chef started out with a tiny Italian deli and slowly revitalized it by adding healthier food options. The new food coupled with Helene’s famous hospitality and masterful French cooking techniques quickly gained popularity, and a family business was born. The book also contains an intriguing history of Vietnam and goes in-depth into the country’s culinary traditions. This alone made the book a worthwhile read for me. There’s a section on selecting and using certain kitchen tools like woks and rice cookers, as well as a section on basic techniques and the favors, uses, and health benefits of select herbs and spices. I found the recipes to be a bit out of my microwave dinner skill set, but that doesn’t mean I wouldn’t want to try my hand at them some day. I did find at least one recipe to which the instructions were a bit unclear, but most of them seemed straight-forward enough. I especially liked the section on libations. I don’t think I would buy this book, but it’s still a wonderful read and a great source for inspiration if you’re interested in fusion cooking. Check the PPLC Catalog for Ăn: to Eat. Categories: AnnMarie's Picks, Books, Cookbooks, Diverse Books, Essays, Food and Drink, Nonfiction, Vietnamese | Permalink.